This article includes following tips in the table of contents about how to debug program written in Small Basic language. And also this article shows you real samples for debugging with published programs. This document is for following versions of programs. For short value to display for debugging, you can use TextWindow.Title, GraphicsWindow.Title or GraphicsWindow.ShowMessage() also. If you wrote a subroutine to show such like an array for debug, that code will be useful also in the future. But, these code will be needed only when you debug. So it is a way to use debug flag to on and off your debug routines. 232. ' 2. Add the neighboring walls of the cell to the wall list. And after debugging is completed, these lines are easily found (with [Ctrl]+F in Small Basic IDE) and removed. Actually these routines are removed in Maze 0.5 (not published). To test your subroutines, it is a reasonable way to write a test program for them. Good test program will find bugs from your subroutines and make easy to check regression after debugging. A program which calculate combination nCr for big n (CPQ608) has a test routine TestDiv() for a generic subroutine Div(). Following parameters were found with TestDiv() and caused problem in Div(). The following list was written when Shapes 1.1 (TLW744) was in debugging. 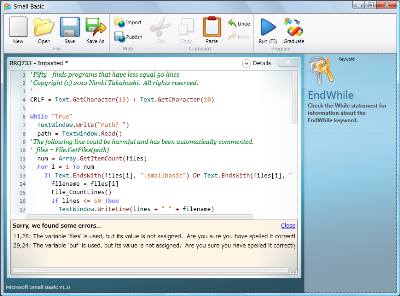 When you write lots of code, you may happen to meet many strange behaviors in your program. If so, it will help you that you write a list that includes each phenomenon. Because there may be many different causes of the phenomena. And after debugging, this list will be a good test set for your program. 11,28: The variable 'files' is used, but its value is not assigned. Are you sure you have spelled it correctly? 29,24: The variable 'buf' is used, but its value is not assigned. Are you sure you have spelled it correctly? The list shown in the text box is called stack trace. This list shows you relations which subroutine calls which subroutine at the error. In this case, the stack trace shows that main part of the program calls Math.Remainder() and occurs error. Despite writing many debug routines, some bugs may be too complicated to find their causes. As a last option, it will work for you to use "Graduate" button to convert Small Basic program to Visual Basic program. This allows you to use strong Visual Studio debugger to find causes of bugs originally in your Small Basic program. Step 4: Select [PROJECT] [Add Reference] [Browse] SmallBasicLibrary.dll [Add] [OK]. Step 5: Rewrite from 'For i = 1 To n' to 'For XXXModule.i = 1 To n' to avoid scope error. Step 6: Double click a source line to make the line as break point if needed. Step 7: Push "Debug Start" button or [F5] key to start program. Step 8: If program stops at break point, push "Step In (F8)" or "Step Over (Shift+F8)" to continue. Step 9: See "Auto Variable", "Local" or "Watch" tab and confirm the values of variables. Step 10: If you find a bug, push "Stop Debugging" button and rewrite your program with comment. Step 11: Repeat from step 6 again. 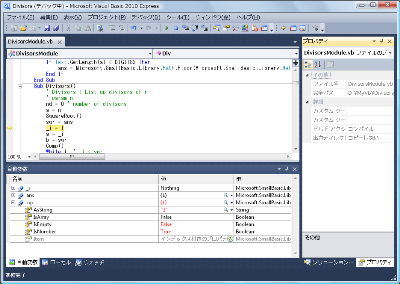 Array : Array notation is arry[i][j] in Small Basic but arry(i)(j) in Visual Basic. Variable type : Small Basic variables are type Primitive so sometimes need type conversion such as 'If ans = CType("", Primitive) Then'. These tips are outputs from programming Small Basic within the last couple of years but not everything. It is important to be creative with programming and debugging. If you find good way, please add the way into this article. Small Basic is very compact and a good language to learn programming with. It's easy and powerful.